A cage may be the place your bird calls home, but chances are you let them roam and play in your actual home too. If that’s the case, this Open Top Small Bird Cage with Stand is a great choice for when your bird takes flight outside of the cage, thanks to a rooftop opening and additional stand to rest on between trips. Of course, the inside is equally luxurious and functional, with a natural wood perch, included stainless steel feed / water cups, and three swing out feeder doors. Is cleanup a concern? Included is a seed catcher that keeps stray feed from spilling all over your floor, while a pullout drawer and grate makes refreshing your bird’s home a breeze. 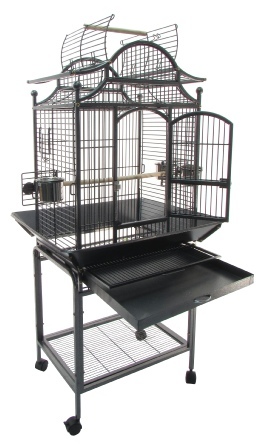 Available in Charcoal Gray, this easy-to-assemble open top small bird cage also comes with its own matching stand with additional storage space and casters to move it between rooms with no hassle. Spacious and sleek ideal for your small- to medium-sized birds. I ordered this cage a few months back. I have a lovebird and wanted something nice for him. This cage is awesome for the price, and free shipping, can't ask for more. Although it is taking my lovie a little time to get used to it, he has a difficult time getting into it, he falls asleep in his coconut that hangs from the front window and I have to transport him to bed after he falls asleep. Solid Little cage, cant beat the price and free shipping, Delivery was quick and the tracking number by Canada post was accurate, the cage is solid steel, powder coated, the wire gauge is thick and strong, the instructions are not that great and the top was a little confusing to put together, but viewing the actual cage picture helped, overall a great product. works well for sun porch and my cockatoo loves sitting on the top. Price is good for as much cage as you get. We purchased this cage for our cottage as a secondary cage, delivery was fast, cage came in one box and my husband assembled it in 35-40 min it is made very well and is very strong. This is a small but very well made cage with lots of key features to be safe with any bird. Love this cage. Bought this as a second cage to have at our vacation home. Went together really quick. Easy to clean. Nice large feeding dishes. My African Grey loves sitting at the top with it open. Rolls around really. Heavy Duty Powder Coated with non-toxic paint.